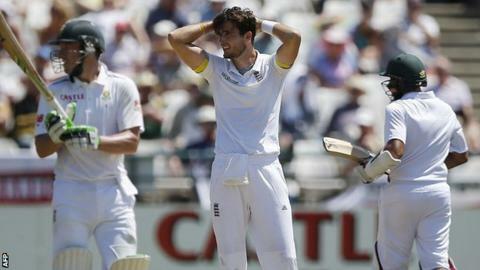 England fast bowler Steven Finn retained hope of victory in the second Test despite South Africa losing only one wicket on the third day. An unbeaten 157 from skipper Hashim Amla helped the Proteas to 353-3 in Cape Town, 276 runs behind England. "We can't fault the effort we put in, we're still a long way ahead so who knows what might happen?" Finn said. "Even though it has been a long hard slog so far we have seen in the past how the game can accelerate at times." "It has been so difficult for England on this pitch, a great swing bowler like Anderson hasn't swung a ball, it hasn't reversed, nothing for the spinner and yet it just shows if England had caught their catches South Africa would have been in a mess." "We're still 276 runs in front. I think it's going to take a very good morning session from us to be able to put South Africa under pressure on that last day but we're not ruling it out," he added. England's quest to take a 2-0 lead in the series with two matches remaining has not been helped by three crucial dropped catches. Joe Root spilled AB de Villiers when he was only on five on day two, while on Monday Amla was dropped on 76 by James Anderson and again when 120 by Nick Compton. "People don't mean to drop catches and if you let your shoulders slump in situations like that it can be hard to come back from it," said Finn, who finally dismissed De Villiers caught at mid-wicket for 88 and claimed 1-82 from 26 overs. "To take one wicket all day is tough, we obviously wanted a lot more than that, but they never got away from us and I thought we stuck to our guns well. "I think there has only been one wicket in the game where someone has been got out by good bowling, the rest have been mistakes by batsmen." Finn revealed to BBC Test Match Special that Alex Hales, who was brought on to bowl spin despite taking only three first-class wickets, once shared the new ball with him in junior cricket. "We opened the bowling together for Hertfordshire Under-12s so that was the last time I saw him bowl and he was bowling seam - he's gone slightly backwards I reckon," he joked. "On days like today things like that may get you that wicket and then your main bowlers can come through. It was fun to see him bowl but unfortunately he didn't get that breakthrough." Amla had scored only 150 combined in his previous 10 innings but returned to form in fine style with his 24th Test century and Finn said: "He's calm, even when I thought I had run him out at the non-striker's end he was just standing there saying 'I don't think I'm out'. "He doesn't seem to break sweat out there, he's obviously a world-class player and they do come through tough patches - unfortunately he did that today against us."